Have You Ever Looked Inside of Your Air Duct System? Dirty Air Ducts Cause Health Problems! The American Lung Association estimates that we spend 90% of our time indoors. Indoor air pollution can be 2 to 3 times more contaminated than outdoor pollution. It's easy to see how a work place could be harmful to a person's health. If you have chronic health problems, they may be related to the indoor air you are breathing. In numerous independent case studies as well as studies conducted by the EPA and OSHA, Sick Building Syndrome, has been traced to air ducts in the workplace and the home. Problems occur when the heating and cooling system in our homes and offices are not routinely and/or properly maintained. Some allergens commonly recirculated in air duct systems are bacteria, pollen, skin flakes, animal dander, decaying organic matter, fungi, hair, dust mites, viruses, textile fibers and residue from chemicals. When we neglect these systems, we pay the price with our health. Contaminated air recirulating throughout a home or office can cause fatigue, runny noses, nasal congestion, headaches, chills, fever, coughing and wheezing and other symptoms related to more serious diseases. A substantial percentage of building occupants complain of symptomes associated with acute discomfort, such as headache, eye, nose, or throat irritation, dry cough, dry or itchy skin, dizziness and nausea, difficulty in concentrating, fatigue and sensitivity to odors and more. These symptoms occur in the home as well. Most of the complaints report relief upon leaving the building or home. The cause of the symptoms is not know. However, sutdies show that such symptoms may be caused by indoor air pollutatns. Today's air conditiong and heating duct systems is where the pollutants (dust, mold, fungi, pollen, bacteria, animal dander, etc.) continue to accumulate. Every time the system is on, these pollutants are blown out into the air inside the home or building. To help remedy the problem, "Air-Care" has devised a service to clean, decontaminate and control the air duct system. Zion Air Care is fully licensed business from Air-Care to provide a quality service to remove all supply registers, thoroughly clean and decontaminate them, vacuum clean the inside of the air handler, return air duct or chamber, and all supply ducting with a "HEPA" (High Efficiency Particulate Air) vacuum unit. Zion Air Care then fogs through the entire system with "Soot Set", which is a water based polymer resin material. All Air-Care's products are safe and non-toxic. Zion Air Care uses an EPA registered sanitizer. This series of steps and pictures is designed to give a general overview of the major steps required to clean and decontaminate a residentail furnace / air conditioner and its associated duct system. *If these steps are followed, the entire duct system and furnace/air conditioner will be clean and decontaminated. The power to the system will be reconnected, and the system will be tested to verify that everything is working properly. Zion Air Care is a licensed company (Cal #789962) not only in air duct cleaning but specialize air conditioning and heating, electrical, and plumbing. Therefore, we have a comprehensive understanding of how the household system works and be able to provide the best service required for your home. We use the systems and parts from the America's largest vendor, Air-Care, and their products are under lifetime warranty. We do our best to clean your dusts, molds, allergans off your air ducts and vents. In order to do that, we only use the best quality equipments and parts. How Can Air Duct Cleaning Can Save You Money? By removing all the dust, debris, and allergens from your air ducts, you are allowing your heating and cooling unit to run at maximum efficiency. To be sure, there are several factors that help to create a completely energy efficient system, which includes a clean filter, a programmable thermostat, among other things. However, one of the main causes of low energy efficiency in a heating and cooling unit is the amount of obstacles in the ducts. Having your air ducts cleaned will help save you money, and depending on how dirty they are, the energy you save from having clean ducts will pay for having the ducts cleaned. Yes, the best customer care is our motto and we certainly guarantee our service. If you are not fully satisfied about our service, we will perform the service until you are pleased. The best way to determine if the air duct system cleaning was effective is to perform a visual inspection of the system before and after cleaning. If any dust or debris can be seen during the visual inspection, the system should not be considered cleaned. While you can perform your own visual inspection using a flash light and mirror, a professional cleaning contractor should be able to allow you better access to system components and perhaps the use of specialized inspection tools. In addition, following this post-cleaning check list can help to ensure a top quality job. Please check yourself about these criteria and let us know if you are not happy with any parts of the service routine, we will gladly perform extra service until you are 100% satisfied. In order to schedule the quickest estimates and air duct cleaning service, please call us at (714) 995-0404 [Toll Free: (866)-579-0404)]. Depending on the availability (usually 1-2 days), we will visit your house and examine your air duct system and give you the estimates for FREE. We are located in Orange County area, and we provide services to more than LA and Orange County Area. So be sure to call in and see if your area may be covered. Depending on the size and condition of the system, the estimates may vary. 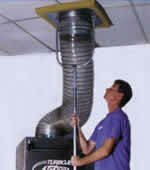 The Environmental Protection Agency says that “duct cleaning services typically – but not always – range in cost from $450 to $1000 per heating and cooling system, depending on the services offered, the size of the system to be cleaned, system accessibility, climactic region, and level of contamination” and type of duct material. Our prices are very competitive, and please be aware that there are "blow-and-go" companies which charge only a nominal fees for their poor jobs. Only service from a licensed company! What Other Services does Zion Air offers? As you may have seen in our homepage, we offer comprehensive household services including installation/ fix of Air Conditioners and Heaters. We are a authorized dealer from American Standard©, and we carry all lines of cooling and heating system of your needs.